It's the brightest one we've ever seen. An international team of scientists has found the brightest gamma-ray binary ever seen, and it’s the first to be seen outside the Milky Way galaxy. The team combined data from NASA’s Fermi Gamma-ray Space Telescope with those from other facilities and confirmed that what was once thought was just a high-mass X-ray binary (HMXB) was in fact, a gamma-ray binary system. Their findings have been published in The Astrophysical Journal. The newly found gamma-ray binary, named LMC P3, was discovered in a small nearby galaxy called Large Magellanic Cloud (LMC), located 163,000 light years away. Gamma-ray binaries are systems wherein there are two stars, one orbiting the other. One is usually a massive star and the other is either a black hole or a neutron star (an extremely magnetic star), and are very rare, with only five found in our galaxy to date. And so far, LMC P3 is the most luminous gamma-ray binary system ever found in terms of gamma rays, X-rays, radio waves and visible light. Having two extremely high-energy bodies within a system undoubtedly causes immense energy to be unleashed. On a regular day, the ozone layer protects us from gamma rays beaming around from outer space. However, gamma-ray bursts can wipe out life in an entire planet, if that planet happens to be in its beam direction. And some postulate that such an event did just that to Earth 450 million years ago. 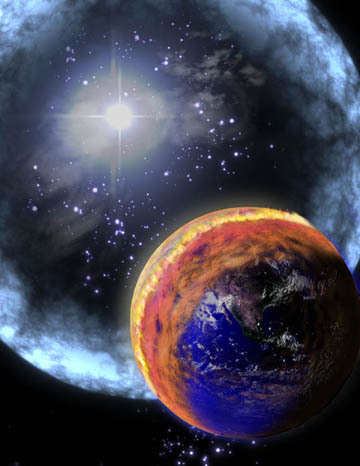 Artist’s concept of a ten-second gamma ray burst wiping out life on Earth. NASA. Such discoveries are incredibly humbling experiences. Even with all of our knowledge and technological achievements, we are still discovering new and exciting phenomena. This exemplifies the importance of scientific curiosity and exploration.